Enjoy the open concept single level living in this beautifully designed and furnished condo. Kitchen includes custom cabinetry, granite counter tops, stainless appliances including fridge, gas range, oven and dishwasher. Condo offers a beautiful dining area perfect for entertaining with seating for 6 people. Living room includes seating for 4, a flat panel television and hardwood floors. Read a book while relaxing on the private porch just off the living room. Master bedroom suite has a king size bed, walk in closet and stunning luxury bathroom. Guest suite has a queen size bed and access to the luxurious guest bath. Condo includes a private washer and dryer, a small storage space, 1 garage parking space and controlled building access. 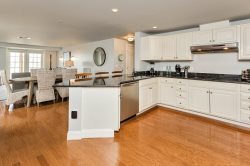 Located in downtown Portland, within walking distance to Casco Bay, the condo is right in the heart of the City. Store fronts and incredible restaurants are just around the corner in this exciting neighborhood.